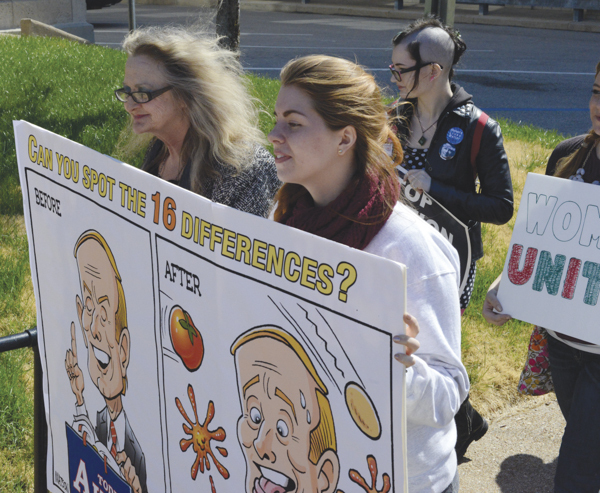 Five Webster University students marched in solidarity alongside more than 80 women’s rights supporters at Missouri’s Capitol on April 8. Junior Daphne Slade chanted “Hey hey, ho ho, these mad men ways have to go” dressed in 1950s attire to represent what she percieves as the legislation’s steps backward. She marched with junior Molly Waters. Junior Molly Waters participates in a rally and lobby for women’s equality and health rights. The march and lobby day were held at the capitol in Jefferson City, Mo on Tuesday, April 8. The itinerary for the day listed several activities, including a march to the Capitol, a hearing and an opportunity for participants to lobby senators within their district. Several buses picked up protestors across the St. Louis area to attend Coalition: Rally for Women’s Lives, a lobby event to advocate for equality. According to the event page hosted by Planned Parenthood, a combination of Planned Parenthood Advocates in Missouri, American Civil Liberties of Missouri, NARAL Pro-Choice Missouri, National Council of Jewish Women and Progress Missouri led the lobby. As the marchers approached the Capitol they encountered anti-abortion activists walking on the opposite side of the street. Central Reform Congregation Rabbi Susan Talve led the rally in one chant: “Pro-choice, yes.” In her speech, she addressed three main issues: equal pay, women’s health and Medicare expansion. After Talve spoke, she introduced Progress Missouri Representative Liz Read Katz, who shared her abortion story. After the rally, Webster sophomore English major, Hart L’Ecuyer, along with other rally members, attended a hearing for House Bill 1613, an Ultrasound Consent Act. The bill states that 72 hours prior to a woman’s abortion, a woman must sign an ultrasound consent form. The bill also states a physician will provide the woman with a copy of their ultrasound and a verbal description of the sonogram with audible heartbeat if present. L’Ecuyer described the hearing was both disgusting and satisfying because the sponsor of the bill seemed cruel to him. “The women who spoke up against the bill were so amazingly eloquent and inspiring,” L’Ecuyer said. 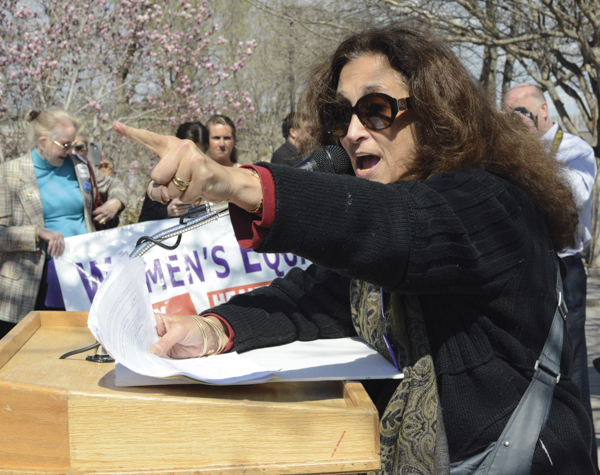 Rabbi Susan Talve spoke at the lobby day about her personal experiences with women’s health rights and issues. Republican Representative Chuck Gatschenberger of District 108 sponsors House Bill 1613, according to house.mo.gov. L’Ecuyer said Gatschenberger compared the 72-hour waiting period to his experience of buying a car or having a carpet cleaned. Ryann Summerford, statewide government affairs manager for Planned Parenthood Advocates in Missouri, said she lobbies against bills like House Bill 1613. She said there are more than 32 anti-abortion bills. Planned Parenthood Intern Jessica Lambrecht said Planned Parenthood plans to have another lobby day for women’s health rights on May 8.